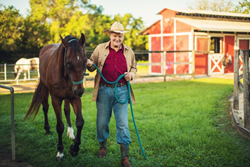 Chuck Bond, founder and chief executive of Bond Insurance Agency, is releasing details on a charity event the firm is undertaking to help rebuild a nonprofit ranch that provides therapeutic and educational programs to veterans. Funds gathered during the event will be provided to the Circle of Veterans and Families, Inc. to help rebuild the facility nearly destroyed by Hurricane Irma. “Working near an Air Force Base means that veterans hold a special place in all of our hearts. We are thrilled to be supporting local veterans in need,” says Bond. The Bond team is relying on community support to help gather funds for the charity drive, and plans to issue donations based on referrals. For every person referred into Bond Insurance to receive a no cost insurance appraisal, the firm will make a direct donation to the Circle of Veterans and Families. More information on how to be part of this event, or suggest future charity events, can be found here: http://bondinsuranceagencyfl.com/rewards/. As a Personal Insurance Representative in Panama City, agency owner Chuck Bond knows many local families. His knowledge and understanding of the people in his community ensures that clients of Bond Insurance Agency are provided with an outstanding level of service. Chuck and his team look forward to helping families protect the things that are most important – family, home, car and more. The Bond Insurance Agency also offers clients a preparation strategy for achieving their financial goals. To contact an expert at Bond Insurance Agency, visit http://bondinsuranceagencyfl.com/ or call (850) 747-1187.